Hayles frames Writing Machines as “an experiment in forging a vocabulary and set of critical practices responsive to the full spectrum of signifying components in print and electronic texts by grounding them in the materiality of the literary artifact” (6). Moving back and forth between  (auto)biographical excurses documenting the experiences of a “Kaye” who is not quite Hayles and  more theoretical chapters (the two eventually merge), Hayles argues that academics in literature must practice “media-specific analysis” attendant to the materiality of electronic and print texts--that is, “the material apparatus producing the literary work as physical artifact” (29). Hayles performs such analyses of Talan Memmott’s electronic work Lexia to Perplexia, Tom Phillips artist’s book A Humument: A Treated Victorian Novel, and Mark Danielewski’s House of Leaves. She includes the third to make clear that “materialist strategies are also intimately involved in a best-selling novel” (110). 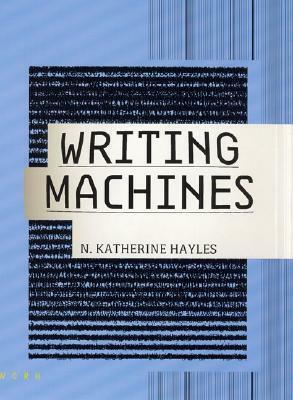 Writing Machines also calls attention to its own materiality, featuring a variety of typefaces, layered images from the texts Hayles analyzes, shifting margins, and other touches by designer Anne Burdick. In addition to foregrounding materiality, Hayles challenges early advocates of hypertext as exaggerating hypertext’s affordances. She instead forwards the concept of “technotexts,” a category comprising any literary work that “interrogates the inscription technology that produces it” and that thus includes even such print works as Danielewski’s (25). She also explores the ways such texts challenge and undermine traditional conceptions of subjectivity. House of Leaves, for instance, “suggests that the appropriate model for subjectivity is a communication circuit rather than discrete individualism, for narration remediation rather than representation, and for reading and writing inscription technology fused with consciousness rather than a mind conveying its thoughts directly to the reader” (130). This is a fascinating book, all about how the materiality of the written word makes a difference for the reader, and about the importance of materiality as well as text. Needless to say, right up my alley. The author doesn't just write these points, she also worked with a designer to make the book feel more like an experience than a "regular" book and to emphasize her points. At times I felt that Hayles thought her ideas were more original than they were (though there were a few acknowledgments of the work of bibliographers and book historians), but she writes well and engagingly about her topic. In Writing Machines (2002), Katherine Hayles argues for understanding materiality as a way to discuss representation and simulation and to explore what texts enable and constrain (6). Hayles argues that materiality can no longer be a subset of literary studies and needs to be central (19), for to change the material aspects of a text is to change how it is read (23). Difficult reading but definitely worth it. She brings together the two worlds of literature and computer programming. The topics she discusses relate more to "how" we read, than to actually reading on a computer, although that is in there too. She also discusses "House of Leaves" which I have yet to get my hands on and read, but sounds fascinating. Wish it had been longer. Critical concepts: technotexts and media-specific analysis. An enjoyable short exploration with some fascinating examples. Read for exams. For an examination of materiality, spends a lot of time thinking about surface features, esp typography. Design elements of the book are pretty cool. N. Katherine Hayles rocks as usual in this book! "Rather than trying to eradicate noise, literary scholars have a vested interest in preserving it."